GENERAL APPEARANCE: Symmetrical, compact, not leggy, obviously built for endurance and hard work. Quick and active mover, displaying plenty of push and drive. CHARACTERISTICS: Very ancient and distinct breed of pure origin. Strong, merry and very active. TEMPERAMENT: Kindly disposition, showing no aggression or nervousness. HEAD & SKULL: Skull of proportionate length, slightly domed, clearly defined stop, well chiselled below the eyes. 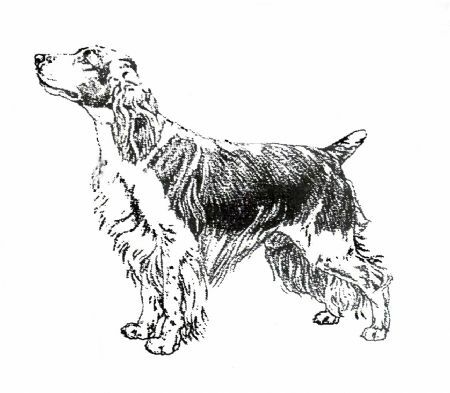 Muzzle of medium length, straight, fairly square. Nostrils well developed, brown or dark. EYES: Hazel or dark, medium size, not prominent, nor sunken, nor showing haw. EARS: Set moderately low and hanging close to cheeks. Comparatively small and gradually narrowing towards tip and shaped somewhat like a vine leaf. MOUTH: Jaws strong with a perfect, regular and complete scissor bite, ie. upper teeth closely overlapping the lower teeth and set square to the jaws. NECK: Long, muscular, clean in throat, neatly set into sloping shoulders. FOREQUARTERS: Forelegs of medium length, straight, well boned. BODY: Not long, strong and muscular. Deep brisket, well sprung ribs. Length of body should be proportionate to length of leg. Loin muscular and slightly arched. Well coupled. HINDQUARTERS: Strong and muscular, wide and fully developed with deep second thighs. Hindlegs well boned, hocks well let down, stifles moderately angled, neither turning in or out. FEET: Round, with thick pads. Firm and cat like, not large or spreading. TAIL: Well set on and low, never carried above level of back, preferably docked. Lively in action. GAIT/MOVEMENT: Smooth, powerful, ground covering action; driving from rear. COAT: Straight or flat, silky texture, dense, never wiry or wavy. Curly coat highly undesirable. Forelegs and hindlegs above the hocks moderately feathered, ears and tail lightly feathered. COLOUR: Rich red and white only. NOTE: Male animals should have two apparently normal testicles descended into the scrotum.